I wrote this a few years ago, but I’ve been thinking again lately about how differently we’re all wired. Although God’s love for each of us is the same, that’s pretty much where the similarity ends. I will never be able to achieve anyone else’s “personal best”–or for that matter meet anyone else’s expectation of what my own personal best should look like–but I can authentically be me and give my all where I am, with what I have. That’s all any of us can (and should) do. The problem comes when we expect others to meet our ideas of what their best should look like without seeing the whole picture in their lives. Thankfully God is the One who does see all, and the One who equips and enables us to be all HE has called us to be. Blessings to you this week as you press on to lay hold of all of that for which He has specifically laid hold of YOU! We’ve all seen the reports in the sports section. An athlete competes in a race and achieves their “personal best.” It’s not a world record. It’s not usually even a regional record. Sometimes it’s not even a school or meet record—it’s just that particular person’s best effort to date. And because it is that person’s best effort—it is noted and celebrated. I’ve been thinking a lot about personal best. My personal best is a lot different from your personal best. And your personal best is a lot different from mine. One person might use only a fraction of their capabilities and do things that literally transform the world. Another person can use absolutely everything they have and no one really takes note. And He knows when you’ve done your personal best. Even when no one else does. We’re not all wired the same way. We don’t all have the same personalities. We don’t all have the same gifts and abilities. We haven’t all had the same life or the same experiences and opportunities. So faithfulness—or personal best—will never look the same from one person to the next. Even in our own lives, our personal best won’t look the same from one day to the next. We don’t all start at the same place. And we don’t all have the same journey. Some have had tremendous support and encouragement throughout their lives—some have had very little. Some have grown up in nurturing loving homes—others have experienced unthinkable abuse at the hands of those who were supposed to love them. Sometimes the balance changes from season to season. Because we are unique, even those who do go through similar experiences–experience them differently. Some have come through horrendous trauma and seem relatively unscathed. Others experience what would be relatively minor for another, yet it wounds and scars them deeply. Only God sees the whole picture in an individual life. We look on the outward appearance of things—God always sees the heart. We can all do our personal best. For some, your personal best is simply getting out of bed today and facing the world one more time. For others, your personal best is going out and changing the world. Whatever it is … do it. And when you do, remember that even when no one else takes note—heaven does. Sometimes, I think the loudest and most exuberant “Well done!” will be reserved for those whose names and faces no one ever knew. Those who quietly endured and continued to run the race despite a lack of earthly success and recognition. Those who continued in faithfulness despite great personal cost and numerous obstacles. Those who gave everything to run their personal best. What about you? 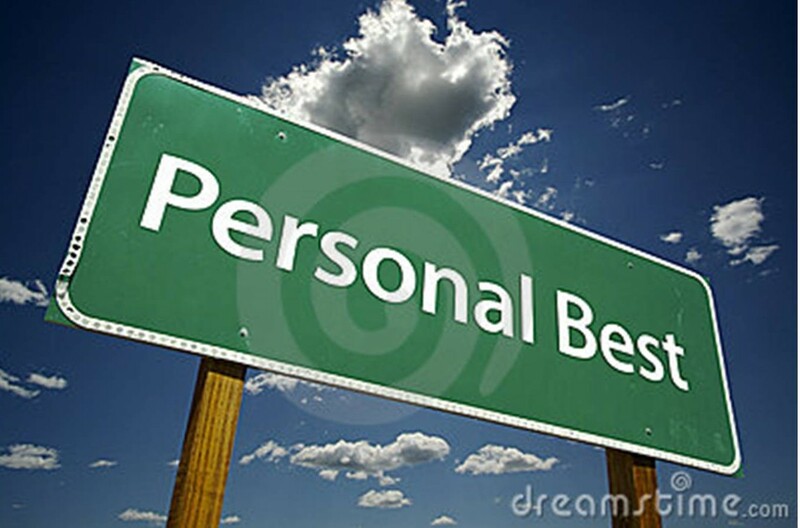 What is your personal best today? Whatever it is, do it. Whether anyone else sees, whether anyone else understands, whether anyone else even cares—do what you know to be your personal best for today. And all of heaven will cheer. Amen, Good word. Very timely. I just came back from a conference and one of the speakers was talking about living in interdependence in community where the grace is flowing in relationship. We’re learning from others, but staying in our own lane (using a track term). We are to run the race we were meant to run, but we don’t run it alone. God made us unique for a reason, but He put us in a community of believers to come along side and help us become the best “us” we can be. Blessings. Amen Mel – that really is it. It does takes the corporate us for us each to become our personal best individual us. We find completion in the whole – not conformity. Really believing God is reshaping our thoughts about that. Like so many things He is upgrading – it’s a good thing! Blessings to you – hope you enjoyed the conference!